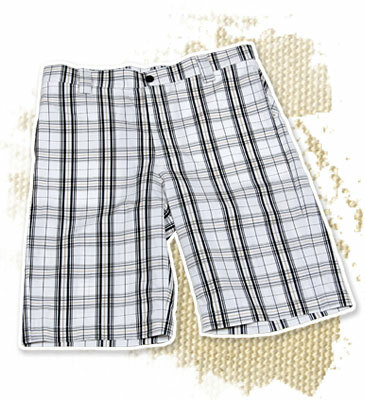 â€œWe started this company as two young, Canadian, guys looking to change the trends in golf fashion. We were tired of our boring golf duds and decided to create a chilled, lifestyle wear. We realized the need for this modern look on such a traditional game when we were working as tour guides, taking young teens through the U.S. to all the major PGA courses. Instead of wearing golf’s big-shot, name-brand clothing to hit the links, we just wore our favorite surf/skate clothes that we felt more comfortable in. not surprisingly, all the young guys rocked the same fashion independence as we did. From this, came the idea to create a line of clothes that are edge and fun, yet respective of the traditional game. 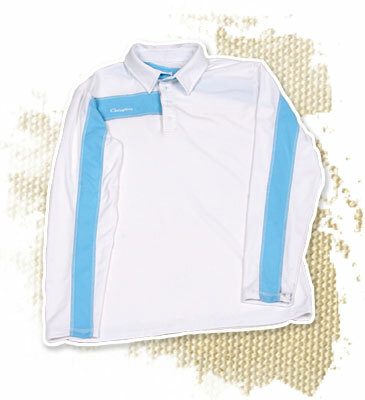 1.Men’s white and light blue long sleeved top they call Breeze. 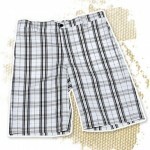 2.Men’s white plaid shorts simply called Plaid. 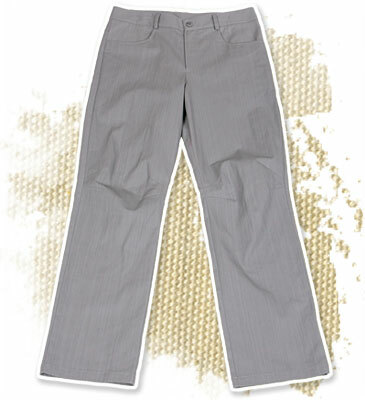 3.Men’s birch pants they call Darts. My cohort Josh B absolutely LOVED the white and light blue long sleeved shirt. 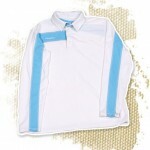 The shirt is almost completely white except for a three inch thick light blue stripe that stretches from the top right shoulder and continues down the right sleeve along with the back left shoulder continuing down the left sleeve. The shirt is just sharp looking, it’s edgy without going over the top. The material is great, lightweight and sweat resistant. It’s perfect for playing golf on a chilly winter morning in Florida, don’t laugh it gets in the 30’s and 40’s in the morning here. The pants and shorts were also very nice, very good quality and very well made, but his top choice was the shirt. The black dress was adorable. 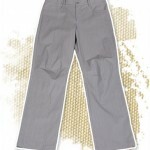 It is knee length and comes with a tie belt for an added feminine touch. My only issue with the dress is that there were no shorts to go with it to keep me covered up when the wind blows on the course. I LOVED that it came with a few colorful tees and a ball marker, what a clever and fun idea! It looks like this particular dress comes in a few different colors which is great, because it’s perfect for the golf course, but like the founders of Quagmire said, it’s great for the course but also great for the patio and spending time with your friends. We were quite pleased with the items that were sent, however, after looking at their website we see that they have so much more to offer. Their fall line has some incredible polos for men with creative and funky designs, and their women’s line has some great looking dresses and playful pleated skirts. We would have loved to test out some samples from their spring line. Based on the sneak preview we received from a press release Quagmire will be bringing back wiked plaids, bright colors, and unique styles made out of some of their signature fabrics like Quag Gud ‘N Dri and Eco Bamboo. The quality and creativity behind Quagmire Golf is quite impressive. The colors and designs are like none I have ever seen. Their new slogan for 2009 best sums up their clothing line â€œfrom the greens to the downtown scenes.” We hope to be able to report back to our readers soon with some outfits from their spring line. This stuff is “must try”. To learn more about Quagmire please visit their website at Quagmire. Love it. That little dress is really cool. I wish they sent more of their spring stuff though. I bought my husband that exact same shirt a few months back. He absolutely loves it. He considers it more of an overshirt. The material is great. That is exactly what Quagmire calls it too. They consider it outerwear. Since we live in Florida that top worked great as just a regular long sleeved shirt, the material is so light. I am so glad your husband liked it, Josh B absolutely loves it! This was a cool preview. I had never heard of this brand before and immediately thought of The Family Guy. After looking at their site, I am hooked. I saw this stuff in the Canadian Open this year and fell in love with the shirts. That guy that won had it on and I have been drooling over it ever since. Hopefully the wife will let me get some for Christmas. I think this might have over taken JL as the nicest clothing for men out there right now. Great review. Thanks for the link in the forum. I really like their clothes. I look forward to the spring stuff when it comes out. I really hope you get to review the spring stuff. Their stuff looks great. That dress is cute. I had not heard of this line and also immediately thought of the tv show. Their clothes look great. This is an outstanding review. Thanks. Never heard of this one, but looks great. I am not going to lie. The first thing I thought of when I read the title was “giddity giddity”. I had not heard of this company before. I have looked through their catalog and I am in love with their clothing. Atleast from appearance on the net. If the material is as good as you guys say it is ( you have not steered me wrong yet) then I will be jumping all over this stuff. This stuff is very Euro looking. I really like it a lot. Especially that dress. Not really sure about this brand. I mean the week is called Spring Fashion Week and they did not even send spring stuff. I would love to know what is coming out next year. I have a couple of Quagmire items and although I like them, I do not put them in the same class as some of the other stuff you have profiled on this site. My son loves the men’s stuff, but their womens like is transparent in my opinion. kers Paradise − Quagmire Golf Spring Fashion Week Preview? Seriously? I was searching Google for birch valley golf course and found this… will have to think about it.